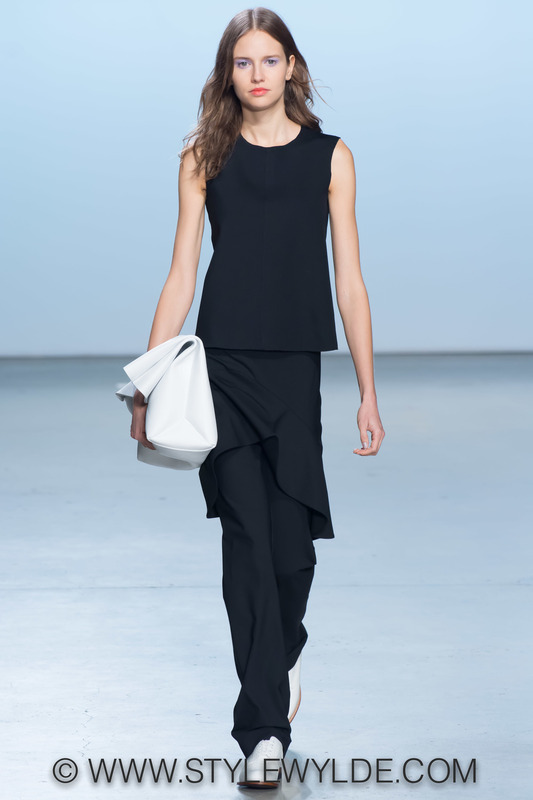 The Sally LaPointe Spring 2015 collection was, as she explained in her show notes, "Inspired by the idea of spring cleaning...streamlining and stripping away. The joy of less confidence and certainty." A refreshing inspiration for sure, and one that feels very unusual for the designer who has in the past focused on much more elaborate ideas which vary from the macabre to the operatic. Is this a leaner, meaner, more sophisticated Sally LaPointe? Most definitely, but the Spring 2015 collection thankfully retained many LaPointe signature touches such as luxe leathers, voluminous sheers and lots of edgy spirit. All images: S. Whittle for Style Wylde. Click here for more from the New York Spring 2015 runways.